Grantham feels like it’s all papered over, boarded up and to let. There *is* life on the high street, but it’s much reduced. Shops everywhere are closed down, old fitments fading in the sunlight, paint peeling, decorators’ equipment lying around on the floor, collections of post piling up on mats and wedged into letterboxes. It’s not *all* like that, of course, but there are several high street names from my teens which have either been replaced by budget shops or simply left derelict. Even good old Marks & Spencer defected a year or so ago. Though I’m told the new development at the back of Westgate has at least a bit of life. It’s the scene of my secondary school, and it becomes an increasing cause for sighs each time I visit it as an adult – which is about once per year, since I’ve never bothered changing my optician. It’s always been a tricky space – a linear high street and similar market street, no obvious square like there is in nearby Newark and vehicular traffic versus pedestrian issues because of it. No markets except on Saturdays because they have to close a road to hold it. These days, it seems to this infrequent visitor to be spiralling further downward. It’s a small town, and the wealth is on the outskirts and in the villages, as it always was, and as they always do the people who have it seem likely to travel increasingly to Newark, whose centre and range of shops and facilities is expanding, or Lincoln which was always larger, and the more they take their wealth away the worse things get for poor old Grantham and the less reason they have to go there and the more likely they are to go elsewhere. Even in my day, we teens in the villages between the two tended to go to Newark for preference – more in it, more flexible bus service to reach it, just a plain nicer place to spend time. All Grantham had, really, was its schools – themselves a relic of the days when selective education was the norm – and a tiny two-screen cinema (the one thing Newark didn’t really have until the last few years). And the homes of schoolfriends, which is why when it came down to it, the Grantham pubs got the underage trade. 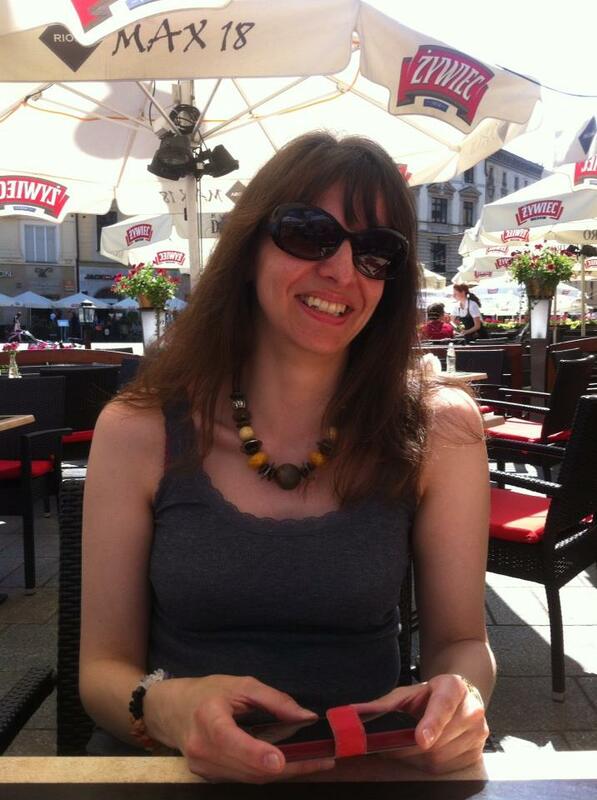 It’s taken me over a month to get around to writing this post about my travels to the wonderful city of Krakow, Poland, in June of this year. Oops. 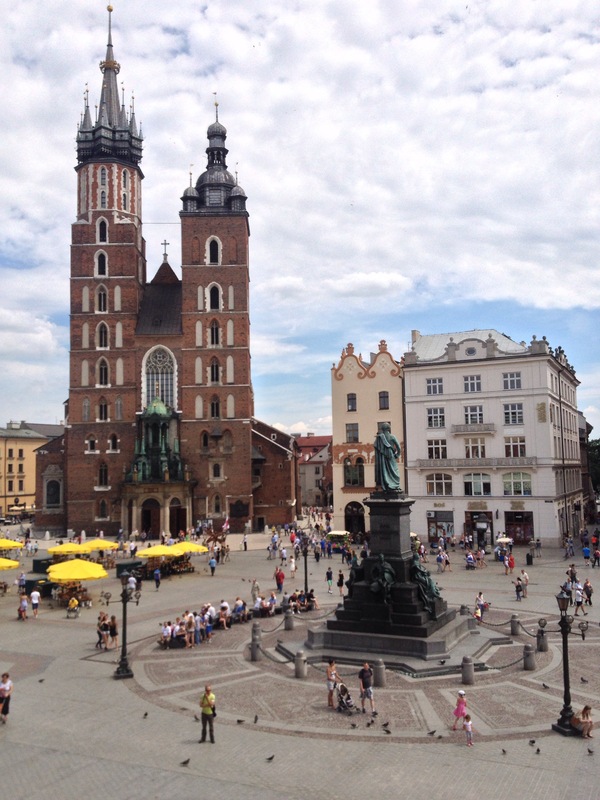 So, Krakow – a beautiful city, centred around a square that’s both vast and architecturally stunning. We went there pre-UK heatwave, and found ourselves experiencing a Polish heatwave (I’m led to believe that countries with more consistent climates than England refer to these weeks of warmth and sunshine as ‘summer’), much to our delight. The square is lined with places to eat, both indoors and al fresco, and since this is Poland the food is both tasty (seriously, try the Pierogi – Polish dumplings, which can be either savoury and sweet and come with a bewildering variety of fillings. They’re on pretty much every menu and they’re absolutely delicious) and inexpensive. You’ll find it a touch pricier on the square than elsewhere in town, but it certainly won’t break the bank. While we’re on the subject of food, there are ice cream and kebab shops everywhere. Unlike in the UK, kebab shops aren’t merely something into which you stumble after a heavy night – for a couple of quid, I grabbed a mighty, not greasy at all and bloody mouthwatering falafel kebab for lunch one day. If you’re after something a little more sophisticated, though, you really won’t be disappointed – there are excellent eateries all over the place, and while as a veggie I wasn’t spoilt for choice in terms of dishes in each place (but then, I never am!) I never lacked for quality meals. First order of business after tipping off the plane was to go forth and fall upon dumplings and a cold drink, and then explore the city. Since we’d been up since 4am, we figured we’d take it easy with one of the buggy rides around the main areas of the town. You’ll find various vendors around the square (always unfailingly polite and never even slightly pushy), and it pays to negotiate on the price, but if you do the full tour of the old town, the Ghetto, and the Jewish Quarter it’ll take you a couple of hours and give you a good overview of the city and an idea of the places you’d like to come back to on foot. Also churches. You’ll see a lot of churches. Very religious country, Poland, so you will see more elaborate churches than you’d think it would be possible to cram into a few square miles. They don’t call Krakow ‘Little Rome’ for nothing! But of course, it’s not without a synagogue or several either – despite less pleasant recent history, Catholics and Jews lived and worshipped in the same city perfectly harmoniously for many years. Some of them are even several hundred feet underground. 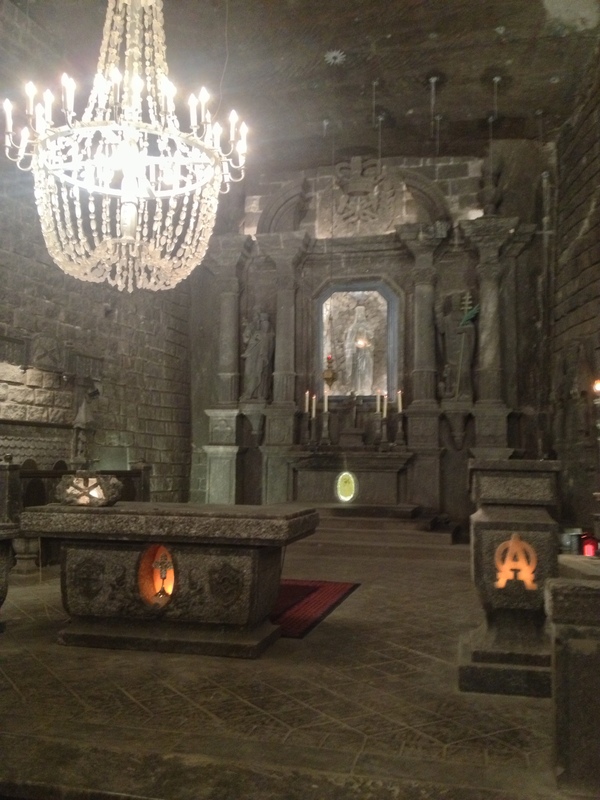 The church in this picture is in the depths of the Wieliczka Saltmines, and has been entirely carved from rock salt by the miners. Everything. Altar, statues, friezes depicting the Last Supper – all of it is made from salt. Even the beads on the chandelier are pure salt. This may be the most spectacular part of the salt mines, but it’s certainly not the only thing of note. It’s an extraordinary place to visit – cool, clean air (reputed to be extremely good for the health – there’s a spa hotel on the same site), decorated at intervals with wonderful statues and sculptures ranging from ancient kings to for some reason an odd little woodland scene involving dwarves. Again, it’ll take a few hours (and isn’t suitable for those of limited mobility – there’s a lot of walking and stairs; there is an alternative wheelchair-friendly route, however) with a knowledgeable tourguide. Worth a visit, too, is Schindler’s Factory over in the Ghetto. It’s a media-rich, densely informative museum to war-era Krakow, and honestly speaking I found that after a couple of hours I simply couldn’t take any more in, between sensory overload of how the messages were delivered and the sheer awfulness of what was being talked about. The reminiscences of people who had been children at the time of being forced into – and out of – the Ghetto were a bone-shocking level of powerful. 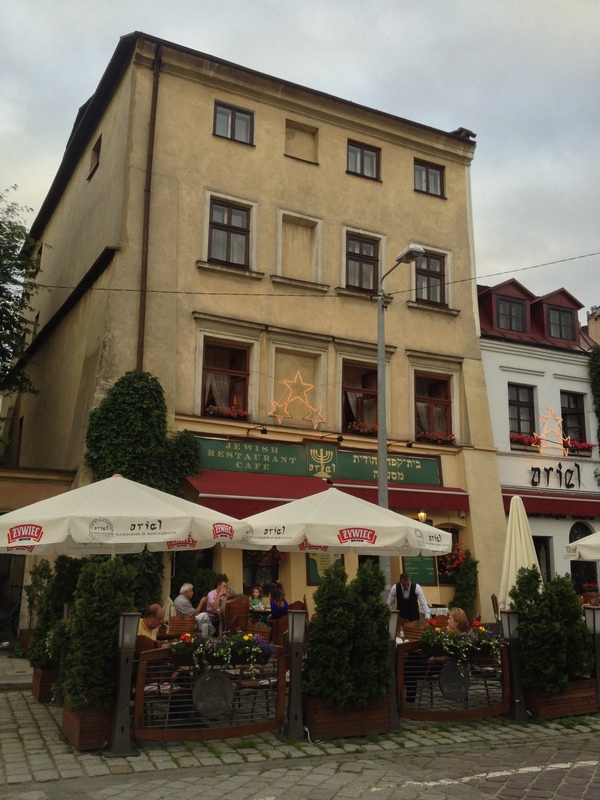 Above ground and when you’re not steeping yourself in history, Krakow is a fabulous city for fans of al fresco people-watching. The Jewish Quarter is still the site of some beautiful buildings (you’ll get the spiel about how some of them appeared in Schindler’s List), including a bar/restaurant that now occupies the site of what were several tiny shops – the original external signs are retained, a suggestion of brickworks illustrates where the shop walls used to be, and the whole is rather charmingly decorated with appropriate knicknacks. Ariel restaurant, shown here, does indeed feature in the film – and serve rather delicious food! Of course, we had ultimately come to Krakow for a reason. Auschwitz. We left it until the day we were flying home, knowing that we didn’t want such a powerful and painful experience to taint our entire break in what is a genuinely beautiful city that is well worth a visit and revisit in and of itself. And it was horrible. Truly horrible. Words can’t really describe the experience with any justice. As you enter, a sombreness descends. The feeling that you’re in a place of such extensive and systematic vileness is almost tangible and grows more oppressive and upsetting as your guide – and hats off to them for doing a tough job with extreme skill and sensitivity – takes you around the camp. The scale of massacre was, as we all know, vast – but numbers can be hard to appreciate on their own, as abstracts. Here, you will be forced to see just a fraction of what those numbers meant in real terms. Collected within, in various piles, were the belongings of just some of the lost victims of Auschwitz. A mound of glasses. A whole room of brushes. A collection of baby clothes. A huge, huge expanse of several tonnes of human hair, from the heads of just some of the women. And two full rooms full of shoes. Flat shoes, heeled shoes, fancy shoes, plain shoes, new shoes, beaten up shoes, big shoes, small shoes. Just piles and piles and piles of shoes stolen from the dead. And a collection of empty gas canisters. 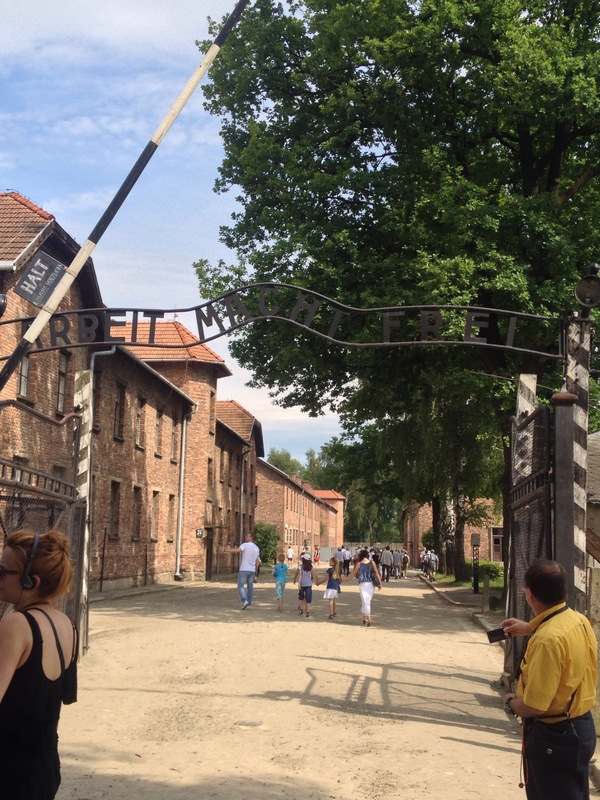 Only one of the gas chambers survives, at either Auschwitz or Birkenau, and it’s a solemn and silent procession of visitors to end your time at Auschwitz I before heading just a little way up the road to the terrifyingly industrial-scale deathcamp that is Birkenau – Auschwitz II. It’s a vast and desolate place now. There’s little there but the site itself, an imposing brick entranceway, a railway line that terminates there. Most of the buildings housing inmates were wooden (pre-fab stables, actually) and have not survived but for the eerie brick chimneys rising in neat rows across the fields. Those that remain give just the tiniest hint at the squalor in which the inhabitants must have been kept. Piles of rubble now mark the spots where thousands lost their lives – the gas chambers, where the clinical art of murder en masse was perfected, were blown up before Allied forces arrived. A memorial, in numerous languages, now stands. Because people should have somewhere to pay their respects to the dead, and events such as these should never, ever be forgotten. 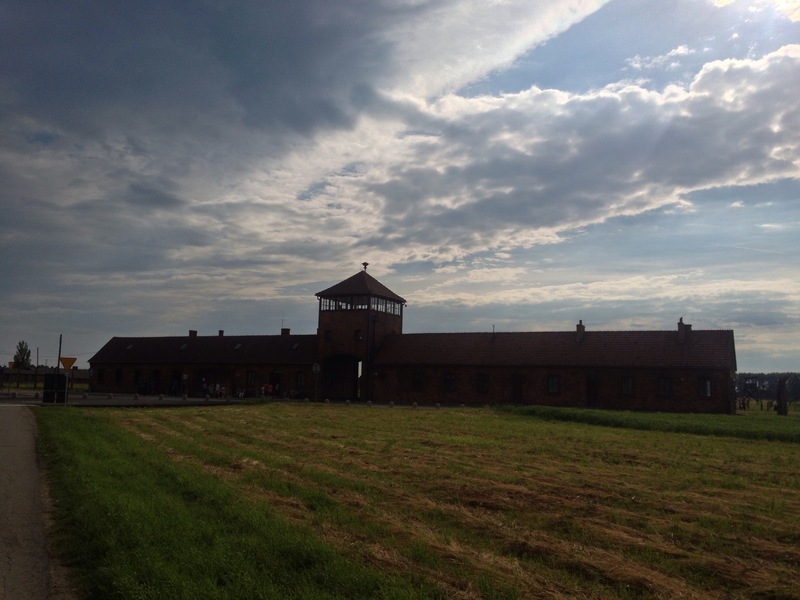 And the birds do fly over Auschwitz, now. I recorded this with a view to personality typing, so that should explain the general thrust of this, but I thought it had a lot of relevance to this blog so here you go. Have a video ramble of me talking about my approach to books, bookclubs, and blogging. Apologies for the light quality – I can always find somewhere a bit less glowy if people like the idea of VideoCat.